Whether you're looking for a premium package for the 2014 Winter Olympics or for economical variants, RIR presents a comprehensive set of options. Sale of “Olympic tour packages” is an established international practice. For example, watching the hockey tournament in Sochi will cost round $14,000 for two, including a four-night stay at a three-star hotel, but excluding airfares. During the Vancouver Olympics, Dash Tour was selling packages for $22,100 apiece, including airfare from any U.S. or Canadian city and 18 nights at a four-star hotel — but admission to Olympic events was extra. In Beijing, local operators offered airfare, hotel accommodation (number of nights depending on the hotel category) and one admission ticket per day, all for $16,000. Russian citizens will be able to buy tickets online through the official website of the 22nd Winter Olympics. Sales have been suspended until the end of the summer though, according to information on the website. Some prices may still be viewed. For instance, the opening ceremony will set you back between $200 and $1,500 [all U.S. dollar amounts are shown at the exchange rate at the time of writing — Editor’s note], while the closing ceremony is cheaper at $150–$1,200. Event tickets cost in the range of $16 for the Mountain Cluster and $30 for the Coastal Cluster. Ice hockey is the most expensive event, with tickets to the finals ranging between $220 and $1,070. The Gala Exhibition in figure skating will cost $150–$720. According to the organizers, more than 40 percent of all tickets will be priced below $100 and half of them below $160. Foreigners wishing to visit Sochi do not have to wait until the end of the summer. The list of official ticket distributors by country is available at the official website. For example, cosport.com, an international distributor, offers tickets to the Mountain Cluster at reasonable prices — bobsleigh for $41 and biathlon starting at $145, for example. However, the opening ceremony is sold out, and the price for the closing ceremony is quoted at $1,379. The ticket price range for the 2012 London Olympics was between $32 and $3,120. Admission to some open-air events was free. The soccer final went for $64–$296. Some 75 percent of tickets cost less than $60. At the 2010 Vancouver Winter Games, tickets started at $25; the opening ceremony cost $175–$1,100, and the closing ceremony ran between $175 and $775. Half of the tickets cost $100 or less. At Beijing 2008, the opening ($650) and the closing ($390) ceremonies were the most expensive events. Spectators did not have to pay more than $20 for most others. Chinese citizens could take advantage of a special offer—$1 per seat. The Russian government has promised hotel accommodation rate controls during the Olympics. Prime Minister Dmitry Medvedev signed a decree in December 2012, capping prices for the duration of the event. Under the document, a double room at a Sochi mini-hotel (1–2 stars) cannot officially cost more than $145; the cost for a stay in a three-star hotel is capped at $180, and four-star stays are capped at $204. Premium hotels cannot charge more than $332 a night. Vancouver hotels hiked prices by an average of 30–40 percent during the Olympic Games (accommodation started from $300 with late booking). London hotels tripled their rates ahead of the Olympics. Beijing hoteliers increased prices by between four- and ten-fold. Bargain options were still available for those willing to do some research. For example, Olympic Family Hotels charged between $50 and $80 per night. 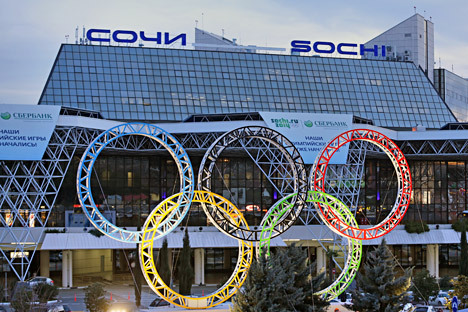 The lack of direct flights to the future Olympic host city is one of the biggest inconveniences for potential visitors to Sochi. Only travelers from CIS capitals and Turkey can book direct flights, while everyone else will have to change planes in Moscow or St. Petersburg. Russian airlines such as S7 and Aeroflot offer flights to Sochi from Moscow. According to the skyscanner.com booking system, prices for February flights have not risen yet, remaining at $130-180 each way. Travel by train is also possible. However, if you enjoy your creature comforts, the least expensive option — “platzkart” (from $80 each way) — is probably not for you. An upgraded level of service in a “coupe” will cost $160, with business class quoted at $330. Those prices are for immediate travel however. It remains to be seen by how much Russian Railways will decide to jack up prices ahead of the Olympics: Train tickets are available for sale no more than 45 days prior to departure. The Russian government has promised to prevent price hikes. Sochi Mayor Anatoly Pakhomov proposed the idea, which has received support from Deputy Prime Minister Dmitry Kozak. He has promised that the government will look for legal ways to control the prices during the Games. Airlines have been known to increase prices of tickets to Olympic host cities by 1.5–2 times, depending on the time of booking.